Eggplant Parmesan, also known by its Italian name of parmigiana di melanzane, is typically made from oven-baked or pan-fried breaded eggplant cutlets smothered in tomato sauce, basil and fresh mozzarella and Parmesan cheeses. This dish originated in southern Italy, although when served in Italy, eggplant Parmesan typically includes slices of hard-boiled egg. Eggplant Parmesan serves up 133 to 160 calories per 5-ounce serving. To bring this into the typical healthy meal range -- 300 to 600 calories, depending on your calorie requirements -- consider serving it with a hearty side salad or a whole grain bread roll. One portion of this dish uses up 6 to 8 grams of the daily recommended allotment of 44 to 78 grams. Three grams of this fat is saturated, a type of fat often referred to as "bad" fat. Limit your consumption of saturated fat to 15 grams or less per day; ingesting too much saturated fat can increase your risk of heart disease. 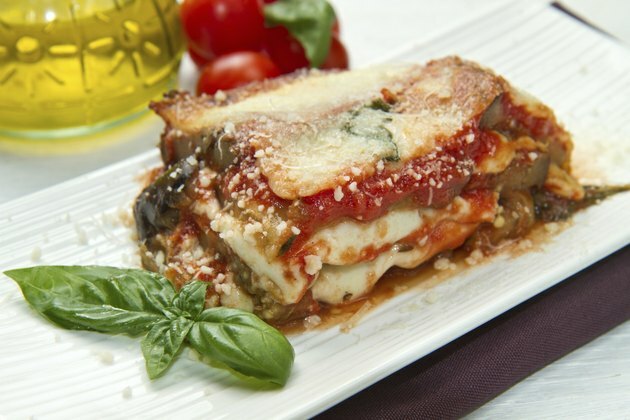 While eggplant lends a meaty quality to eggplant Parmesan, it provides less protein than meat. Each 5-ounce serving of eggplant Parmesan has 7 to 9 grams of protein, an amount that contributes to but does not meet your daily protein needs of 46 to 56 grams. One portion of this dish contains 13 to 16 grams of carbohydrates, accounting for 10 to 12.3 percent of the 130 grams your meal plan should include every day. Some of the carbs in eggplant Parmesan take the form of fiber, a carbohydrate that does not break down for energy use -- instead, fiber helps keep your digestion system functioning smoothly. A serving provides 3 grams. Including eggplant Parmesan in your diet gives you a big boost of vitamin A, satisfying 25 to 29 percent of the amount you require each day. This vitamin provides a variety of eye benefits, but Ian Marber, a nutrition consultant recommends boosting your intake of vitamin A, among other nutrients, before you travel as a way of warding off illnesses and infections that can result when you fly on a plane; vitamin A helps produce antibodies. You will also get up to 17 percent of the daily recommended intake of calcium and 10 to 13 percent of the vitamin C you need daily in each portion of eggplant Parmesan. Eggplant Parmesan can contain quite a bit of sodium -- up to 417 milligrams per portion, or nearly 1/3 of the recommended limit of 1,500 milligrams per day. The average American consumes more than twice this amount, according to the Centers for Disease Control and Prevention, and an article in the January 2011 issue of "Circulation: Journal of the American Heart Association" indicates that Americans could decrease the cost of treating heart disease by $24 billion per year if more effort were made to reduce sodium consumption to 1,200 milligrams every day.